Composed by Juan Bautista Pla. Edited by Walter Lebermann. Sheet music. 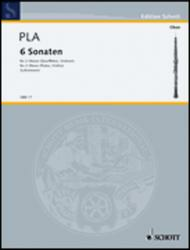 Oboen-Bibiothek (Oboe Library). Classical. Playing score. 28 pages. Schott Music #OBB17. Published by Schott Music (HL.49011128).